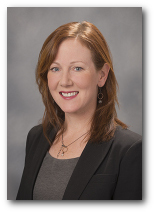 Laura J Eakes, Partner at Walker & Eakes LLC an Anchorage Alaska insurance defense law firm. "Laura made me feel very calm & reassured about the whole process. If there is a bright side to being sued, Laura is it!" Born and raised in Southeast Alaska, Laura obtained an education degree in 1993 and taught as a reading specialist, before pursuing a legal career. She graduated from the University of Oregon with a Juris Doctorate in 2000. Desiring to return to Alaska, Laura joined the Anchorage law firm of Richmond & Quinn where she practiced exclusively insurance defense and made partner in 2005. In 2006, Laura cofounded Walker & Eakes LLC with Stacy Walker. An efficient and hardworking attorney, Laura has taken fourteen cases to jury trial and ten cases to arbitration with excellent results. Laura takes pride in her interpersonal skills and ability to put clients at ease during the litigation process.